THE CONVERTORUM: Why so serious? Botched the spraypaint again. Not as bad as on the chem-dog as most of the textured surface ended up on the back of his head, but I still need to rethink how I prep my minis. That or simply buy a new can of bone spray. I'm curious as to what the problem is with the spray. My wife is out drinking at the moment, and she's much better with sprays than me. But if it is just the bone spray and not the others, it is not likely to be humidity or temperature. Given the bone is coming in from a different direction than the other sprays, are you holding it a different distance from the model, shaking the can less or unintentionally changing direction while the spray is on the model? Sometimes you can pick up unintentional habits or rituals which cause the problem. It is also totally worth checking if it is a duff can, though! I've had a couple of white cans do similar in the past. I think it's a bad can actually - but the more spraycoats you use the larger the risk of running into similar problems. I'll probably limit myself to two - black and brown on minis like this in the future. When batch-painting it's a different matter - then you can afford to mess up a model or two. Quite like the orange on the ruff! And the bionic eye is an addition that moves it more to the 40k side of things. Glad you like it, sir - he needed something to place him in the 41st millenium. Very creepy. Have you thought about using an airbrush for priming and basecoating? You can get a very consistent finish. I'd encourage you to try again with the airbrush possibly? I've just started using on, and grabbing a decent model with a larger nozzle size like the Patriot 105 I have, and a compressor is great for priming and a few basic layers of paint. I haven't done anything tricky with it yet, but honestly, you don't need to :) Plus it helps to be able to do it inside when it's moist/humid outside. No matter what, amazing work Jeff!!! SO much character in one little figure. I have exactly the same problem with white undercoat, so much so that I now brush on a bone undercoat before adding another spray eg red. This smoother brush finish seems to give a better base for the second sprayed colour. Not too bad for infantry but brush coating a tank is a pain! Looking great btw love the colours. Looks ace, I like how the bionic eye subtley ties him into the 40k world. If he was on a square base, he wouldn't look out of place in a Mordheim campaign. I like it. With regards to priming and basecoating, I would also recommend using an airbrush. If you're only really using it for priming and basecoats, you could easily just get a cheap one that would work well. * Drop me an email if you have any questions about airbrushes. *New to this site, so apologies if you already airbrush. Fair one, they are somewhat of a time and financial investment. Have been working my way through the blog, there are some cracking conversions on here. Nice one! Really great stuff. I am new to this site but absolutely loving your work. It is inspiring me to start an inq28 modelling project. Your imagination and creativity are very inspiring and your painting style really brings out and builds on an excellent conversion (can you tell I love your stuff yet ;) ) Love the ruff and hat on this dude. 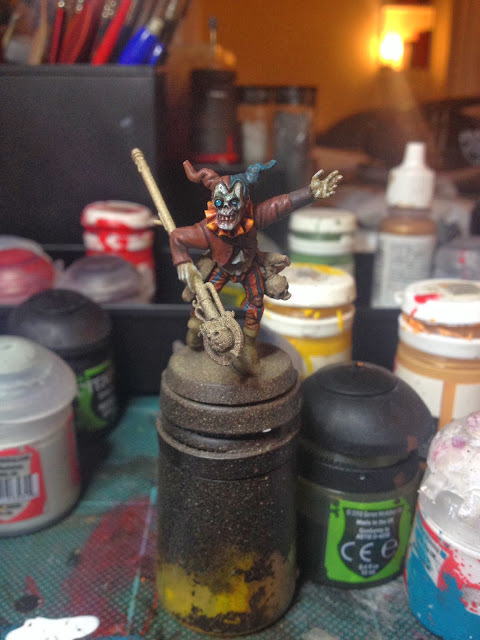 I have tried to make a hat like this one on a few of my dark eldar carnival army project (http://www.thedarkcity.net/t6097-harlequin-carnival-la-danse-macabre) but really like how yours have turned out. I am going to have to try and sculpt a few ruffles like you have done. Awesome work! The inspiration for this project was this excellent tutorial on how to sculpt ruffles by Ana over at "Gardens of Hecate". Check it out! Some really interesting harlies you´ve got there! You might consider doing black and brown sprays, as you suggest, followed by a zenithal dry-brush of white. Should achieve a similar effect, with a trade of more time for more control. Not for large batches, perhaps, but might work for individual figs. Unfortunately, I can't lend any advice on sprays since I've always undercoated by brush. I'm going to clown-school and you can't stop me!